When I first caught word of a Black Veil Brides film, I knew I would one day be tasked with reviewing said feature for this website. If we’re being completely honest, we anticipated the excitement over the film so much that we actually tried to secure it for a special screening for readers, but I can inform you now that plan never materialized. We were bummed for awhile, but today Black Veil Brides released the feature, entitled Legion Of The Black, digitally for everyone to enjoy and left us with really no reason to complain. If you read this on January 6 and have $5 to spare, you can watch the feature for yourself through Facebook. I know we haven’t gotten to a word of the review yet, but it’s only $5, so there is really no reason for any true BVB fan to not at least give the flick a chance. Legion Of The Black is a 45-minute companion piece to Wretched And Divine, the forthcoming Sophomore album from Black Veil Brides. Unlike similar features, which use the themes of the album to create an original story, Legion chooses to let the music and interludes of the album guide what you see in the story. For the viewer, this mean getting two stories for the price of one. The first is that of a high school aged girl who personifies the stereotypical Black Veil Brides family and her struggle in a world where everyone sees what makes her different as something that makes her broken, while the other serves as a quasi-performance piece coupled with metaphorical retelling of the same story complete with super powers, masked villains, and mini music videos for almost every song of the album. For a diehard fan, there really is nothing more you could ask for from such a release. What about the rest of us? Is there enough engaging content and original ideas to pull in people who may have previously never given Black Veil Brides the time of day? The answer is, unfortunately, yes and no. The decision to set the entire thing to music (there is not a single line of dialogue aside from the interludes) obviously sets the film up for those already familiar with BVB, but I dare say there is enough creativity in the metaphorical/performance-laden side of the film to warrant repeat viewings from any fan of rock musicals. Each member of BVB has a special purpose in the storyline, be it superpower or otherwise, and to see them further their already well-developed image like this is enough to make any music fan at least intrigued as to where the future may take them. Legion Of The Black is Kiss Meets The Phantom Of The Park for a new generation, and the reaction one has to it will be highly skewed by whether or not they enjoy the work of Black Veil Brides. Nevertheless, this feature is simply too unique to pan, and I must insist anyone with an open mind give it at least a few minutes of their time. 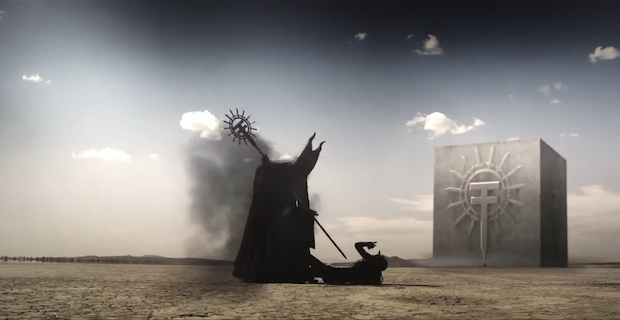 You can get a taste for Legion Of The Black by viewing the video for “In The End” below. Most of the footage is taken from the feature, so use this as a guide to whether or not you choose to watch. I know right. It broke my heart too.